Confession: I have not read the comments so there are bound to be many repeats. Anybody who has read all the comments are advised to stay away! According to me, Neele neele ambar par (from the film, Kalakaar) is the biggest hit from a flop film. Kunal Goswami's turn as a guitar-toting singing sensation did not make any impact as he behaved like his father in Kranti (which I am told, was Kunal’s first movie as a child star). I vaguely recall the song being sung in a college-picnic / bonfire kind of setting in which Sridevi falls in love with Kishore Kumar's voice and had contend with Kunal's wooden looks. Maula mere maula from the UFO called Anwar has suddenly emerged as a strong contender for the above title. A lovely song in the sufi style, it had taken over all the FM channels in the last few months while its film had a blue-faced Krishna-type character gracing some posters, which I saw in multiplexes. The film also apparently released but sank without such a lack of trace that it is ranked alongside Atlantis and Hoffa among the greatest disappearances in world history. On the other hand, Shootout at Lokhandwala with Ganpat did not vanish as cleanly. Sili hawa chhoo gayee from Libaas made it to the top of every countdown show in town despite having two major disadvantages. One, it had no jhankaar beats. Two, the song was filmed on Shabana Azmi and Raj Babbar, who are not exactly teeny-bopper favourites. They are not quite pushovers either but in the context of Divya Bharti in the days of Superhit Muqabla, they were quite unknown. Come to think of it, the film never flopped because it never found a theatrical release! Probably the last film of the RD-Gulzar combine, the music had everything except for distribution. Ajay Devgan and Sonali Bendre are not exactly flop stars though they have acted in innumerable flop films. One of their biggest flops is undoubtedly Diljale. Produced and directed by Harry Baweja (of Love Story 2050 fame), this came on the back of a reasonable hit called Dilwale, causing Nilendu and me to speculate if Mr Baweja is on a Dil**le series. Dilwale starred Ajay Devgan, Sunil Shetty and Raveena Tandon among others and is famous for a romance brewing between Ajay and Raveena on its sets because of which Raveena Tandon and Karisma Kapoor had a showdown in Bombay airport causing Ajay to dump them both and hook up with Kajol while Raveena Tandon went ahead with Akshay Kumar. Damn, my asides are longer than my main points! Anyway, Diljale had one song (a moderate hit, picturised on Ajay Devgan) which was played all over but I have forgotten by now. It had an even better song - Kisse poochhoo us ladki ka naam - picturised on Parmeet Sethi, which was never played on the music channels because he was a non-entity. Anu Malik redeemed himself of his early 90's crap with this one song, lovingly written by Javed Akhtar. Another example of a hit song from a flop film needs unravelling of a very dark chapter from my past. In college, I hung around the fringes of the Calcutta quizzing circuit, which is unquestionably the toughest (and also, the most sarcastic!) circuit of the country. But in a strange snobbery, the Bollywood questions asked in Calcutta quizzes were terribly easy because it was still unfashionable for the Bangali bhadralok to admit that he derived pleasure from Govinda's pelvis... okay, that sounded a little odd but you know what I mean, right? In one such quiz, they played the music video (starring Anupama Verma) Boom Boom and asked us to name the original film the song was from. The other participants - who were used to questions like 'what is the full form of DDLJ' - froze. My team relaxed because they knew I would get it. Nilendu was in the audience and again wondered all is not well with the world. I, of course, forgot the name of the Kumar Gaurav starrer (of which Nilendu owned a LP record in a dog-eared cover). It was from a movie called Star and my inability to answer that caused me more embarrassment that my flunking Engineering Mechanics in the first semester! As a footnote, one may add that most (if not all) of Kumar Gaurav’s songs can feature in hit-gaana-flop-hero list. He acted in a reasonable large body of musically competent but cinematically crap films. How many of you have heard / remembered a film called Don II? However, most of you would remember the Hawa Hawa (e hawa, khushboo luta de) song from the album, performed by one Mr Hassan Jehangir who was supposed to be a Pakistani star. The album had some eight or ten songs, all of which were quite good and some of them were runaway hits, despite the rather poor quality of recording. Enthused by the success of his album, Hassan landed up in India and made a film (which looked worse than a music video) to fit in all his songs and dreamt of having an affair with Raveen Tandon but all his fans vanished in a puff of smoke the moment they say his hennaed hair and pot-bellied figure! No, the film never released. In fact, I don’t even know if the full film ever got made. At one point in the early 1990's, the most powerful man in Bollywood was not Amitabh Bachchan, it was not Yash Chopra, it was Gulshan Kumar. The T-Series baron - with a little bit of help from Nadeem-Shravan, Kumar Sanu and Anuradh Paudwal - churned out hit album after hit album, clocking massive sales of the tapes irrespective of the movie's box office fate. But as Hindi film villains keep on saying, "Har insaan ki koi kamzori hoti hain...", Gulshan had a brother called Krishan who had ambitions to become a film star. Among his assets was an ability to wear heavy leather jackets in summer (including beach scenes), extremely bushy & expressive eyebrows and of course, his brother's undying love. Armed with this, he acted in a series of devastating flops (which would have sunk many a lesser producer but not Gulshan! ), almost all of which had decent soundtracks. Particularly nice is the title song from the film Aaja Meri Jaan (which was a teen-romance-murder-mystery on the lines of Khiladi), which also starred his eventual wife - Tanya Singh. The wound of the posters - "Starring Dashing Krishan Kumar and Cute Tanya" - on my memory is still raw. Another movie of his (with another hit-but-hated song Achha sila diya tune mere pyaar ka / yaar ne hi loot liya ghar yaar ka) was called Bewafa Sanam (not to be mistaken with Sanam Bewafa, starring Salman Khan and Roshni) - in which his best friend framed him, got him jailed and married his childhood sweetheart. Something like what Nadeem did to Gulshan Kumar. At this point of time, it would be advisable to take a couple of steps backward and land in the 50-60’s. For example, Pradip Kumar Batabyal is a total non-entity as far as my wife and sister are concerned, his film Taj Mahal is a flop in their eyes but even they cannot deny the power of the brilliant Jo wada kiya wo toh nibhana padega. Just as people would be hard-pressed to remember the stars of Saraswati Chandra (which was a moderate success, at best) but Retro Café on Radio City (9 PM, weeknights) would have folded up long time back if they were not allowed to play Chandan sa badan, chanchal chitwan. Does Joy Mukherjee qualify as a non-entity? A lot of youngsters would probably agree but I would join my mother in protesting very strongly as the 1960's scion of the Mukherjee family was a big star and a string of hits like Love in Tokyo, Phir Wohi Dil Laya Hoon and most importantly, Shagird. So, I would leave the discussion here. Ever since I saw an Indian Idol contestant (incidentally, a Bengali) whose life’s ambition was to meet Aftab Shivdasani and Nauheed Cyrusi, I realized that it is futile to classify success and failure according to conventional wisdom. After all, Pran singing Yaari hain imaan mera along with a non-entity hero in Zanjeer could well have been part of this list. 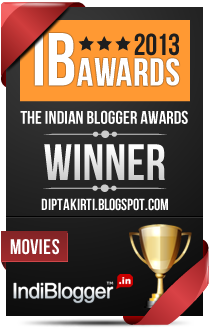 It has been a really long time since I wrote a proper Bollywood post. Did take a few short singles but they were hardly anywhere near a decent innings. Elsewhere, Nilendu shut down his blog as well. It is rather ironic that with three top stars blogging, there’s nothing on Bollywood worth reading on the ‘net! I should really be doing yet another 2000-word essay on a pet topic – which would be something like therapy. But that would take some time. 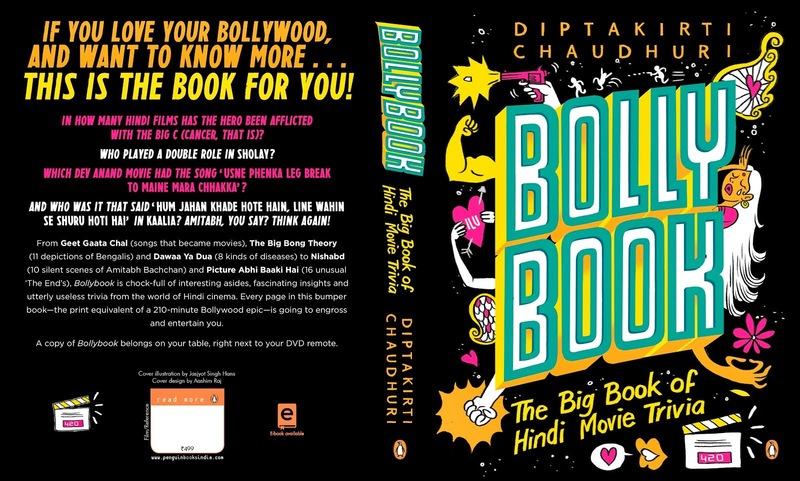 Instead, this post is a quickie quiz on Bollywood. Digging into the cobwebbed recesses of my hard drive, I scrounged out 20 Questions. And I broke them up into two parts. Part I needs a basic amount of Bolly gyan and you can work out the answers from common sense. Which means you should get all the answers (or come very close) if you have watched a reasonable clutch of movies and have a half-decent memory. Part II, obviously, needs you to be a little more devoted. Answers can be mailed to me (address on my profile page). You can even post them in the comments if you are the showing-off type. And if you are Udayan, you can just write a rude comment. Did you ask ‘prizes’? Hell – people like you should be doing things for the challenge and not the money! PART I 1. In the film Sholay, how many times was the coin tossed? 2. In the film Chashme Baddoor, what brand of detergent was Deepti Naval selling when she came to Farooq Shaikh’s flat? 3. Between which two stations did Amol Palekar and Tina Munim travel on a Mumbai local in the film Baaton Baaton Mein? 4. Which sibling duo sang the children’s version of the song ‘Kitni hain pyaari pyaari dosti hamaari’ from the film Parinda? 5. In the climactic cycle race of Jo Jeeta Wohi Sikandar, which school came third? 6. In the film Utsav, why was Amjad Khan’s character constantly peeping into rooms of prostitutes? 7. Which Assistant Director is common to the movies Swades, Saathiya, Lagaan and Monsoon Wedding? 8. Which film ends with the line – ‘Jai Dharmendra’? 9. Which star made his debut as a child artiste in the film Ek Baar Phir? 10. With what was the sound effect of fluttering pigeons’ wings created on screen for the film Parinda? PART II1. Which brand of biscuit did Gabbar Singh endorse after the success of Sholay? 2. What is common to Kabhi Kabhie, Anand, Manzil, Baghban – apart from being Amitabh Bachchan films? 3. In which landmark film was Anupam Kher supposed to debut before his part got edited out? 4. Who are Ashok Banjara, Gibreel Farishta and Akshay Arora? 5. In the song Ruk jaa o jaanewaali ruk jaa from the film Kanhaiya (starring Raj Kapoor), who is the jaanewaali? 6. In the film Yeh Vaada Raha, Jaya Bhaduri dubbed the voices of Poonam Dhillon and Tina Munim. Why was the dubbing required? 7. When the heroes enter the AIR Building in Rang De Basanti, what is the name of the on-air programme? 8. In which film does Amitabh Bachchan share his name with Javed Akhtar’s father? 9. Which is the only film till date in which Aamir Khan and Shah Rukh Khan appear together? 10. Name two actors who have won the Booker Prize in Hindi films. I thought its time I moved ahead a little. So, the first four paragraphs are 56 (!) words each. The questions add up to 336 (56 x 6) words, making a total of 560 words. Overwhelming response – though I must admit I should have barred Nilendu from participating because not only did he give most of the answers away, he even sneered at some of the easy questions, deliberately did not answer some of the even easier ones and hijacked the quiz mid-way to explain answers. But then, I should have known better! Anyways, here are the answers. 1. The easiest question did not get a single correct answer. All you had to do was to replay the film in your mind. The coin was tossed four times. One, for taking the injured Thakur to the hospital. Two, when the coin landed on its side (during the Yeh Dosti song). Three, for deciding to go to Ramgarh. Four, for deciding who fights the dacoits. 2. This turned out to be the easiest. 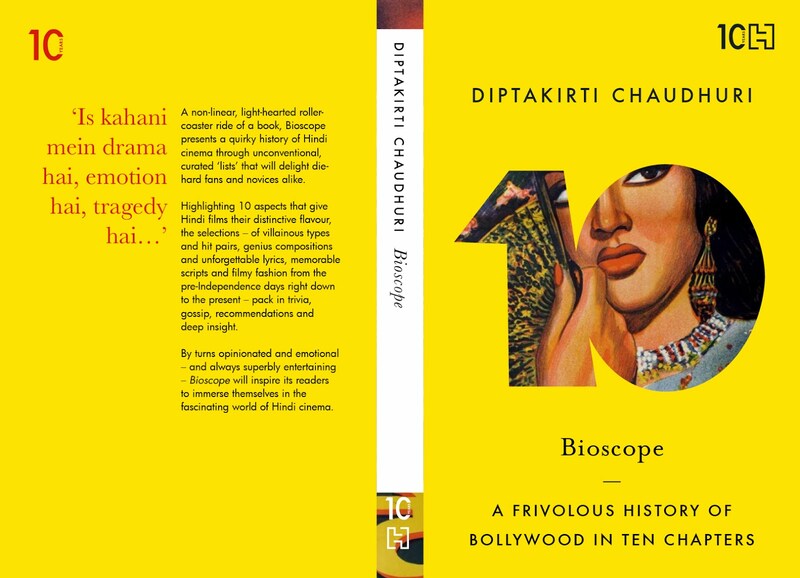 Everybody remembered Deepti Naval was called Miss Chamko for some time during the film! 3. At no point is it mentioned in the film but the landmarks clearly indicate Bandra and Churchgate (not Marine Lines!). 4. Again, widely answered. I made it easy by mentioning that song was sung by siblings and everybody knows only Shan(tanu) and Sagarika Mukherjee. 5. Surprisingly, zero correct answers. Sanjaylal Sharma of Model School came first. Rajput came second. That leaves two other participating schools – yellow-jerseyed Xavier’s and black-jerseyed Lawrence. The guy behind the first two was wearing a black jersey. 6. This becomes a cake walk if you know the character played by Amjad Khan – Vatsyayana. Obviously, he was doing research for a book which he wanted to call Kama Sutra. 7. Again, everybody answered correctly with the most famous AD in Bollywood – Kiran Rao. 8. Which movie do you think projects Dharam as the biggest hero? Dharamveer, right? But in which film is he projected as a hero and his name is Dharmendra. The film is Guddi – where he plays the object of Jaya Bhaduri’s adulation and saves the day with a superstar-with-a-heart-of-gold act. 9. Ek Baar Phir had only one future star connection. The lead actor was one Suresh Oberoi, whose son Viveik was hanging around the sets. And he’s the one! 10. Fluttering of wings can be equated with only one thing. But you need to be RD Burman to think of that. He got a whole bunch of telephone directories and flipped through their pages to overwhelm the audience with pigeon flutterings. And this was long before Dolby and surround sound. And no – it’s NOT Nana Patekar’s anything. 1. I wanted the brand (which Roger Rabbit provided – Britannia Glucose). Actress Maya Alagh contacted Amjad on the behalf of her husband, Sunil – who later went on to become the CEO of the company. I have seen the actual ad (“Gabbar Singh ki asli pasand”) on the back cover of Indrajal Comics. 2. Surprisingly, nobody got this correct though people came close. These films are also names of books written by Amitabh in various films. The last 3 are from the eponymous films but Manzil was a book written by him in the film Ek Nazar (I think). 3. The film was Jaane Bhi Do Yaaron. And the character’s name was supposed to be Disco Killer. 4. 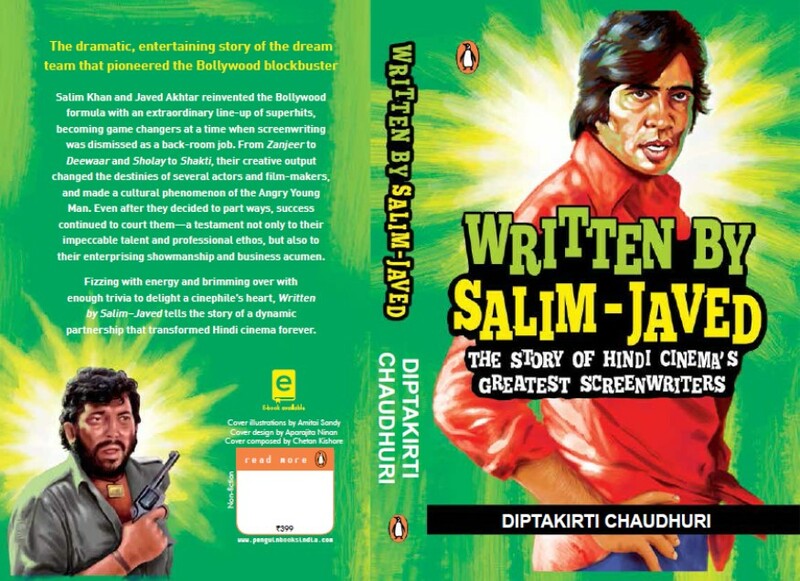 These are Bollywood characters (loosely based on Amitabh Bachchan) by created by Indo-Anglian authors – Shashi Tharoor (for Show Business), Salman Rushdie (for The Satanic Verses) and Shobha De (for Starry Nights). Everybody got the connection and also thought it to be too easy to name the novels they are from. @ Wanderlust: If Mr Tharoor says that a Bollywood superstar who has an affair with a co-star, a fatal accident on the sets and a tryst with politics is not Amitabh Bachchan, then I would have to take it with a pinch of salt. 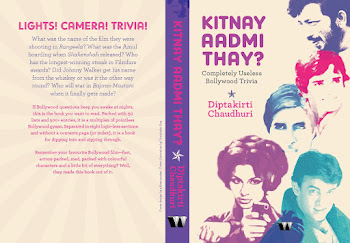 And no, there are no fleeting references to Amitabh in the novel! 5. It is a bottle of liquor, which the drunkard Raj Kapoor follows down a slope. 6. In the film, Rishi Kapoor’s girlfriend Poonam has an accident and her disfigured face is restored by plastic surgery and she becomes Tina. So, both the heroines played the same character – who had to have the same voice! And the voice was that of Jaya Bhaduri. And why did either of them not dub for the other? Because it would have created ego clashes, which could have been resolved only by having a ‘senior’ doing the dubbing. 7. Real-life VJ Cyrus Sahukar was on air with the show – Raat Baaki Baat Baaki – when the gang hijacked the building. 9. The operative word was together. SRK and Aamir appear in Pehla Nasha in different scenes. Actually SRK and Aamir did appear together in Pehla Nasha but I have a different totka. If you know Aamir Khan played one of the kid brothers in the film Yaadon Ki Baraat and remember that Shah Rukh was watching the same film in Swades, then you would have probably noticed the fleeting moment when both appear in the same frame. It is the only time. Yet. For obvious reasons, this is my favourite question. 10. Amitabh Bachchan in Baghban and Sanjay Dutt in Shabd are the lucky two! Though I must admit that I was stumped by the ‘Anon’ who came up with Vatsal Seth of Nanhe Jaisalmer. As for Arundhati Roy, she acted in Massey Sahib and Annie – both of which were directed by her husband, Pradeep Kishen – now better known for writing a book on the trees of Delhi. She also wrote the screenplay for Annie (a genuinely funny script, though I have not seen the film) and Electric Moon, yet another Pradeep Kishen venture. A business associate just came to wish me goodbye since she is leaving her job. Her future plans include "taking a break, travelling to Spain and Greece before joining a PE firm in Boston in October". Waaaaahhhh - I want to be like her when I grow up! Before this, my childhood ambition (apart from James Bond) was him. Because when I asked him what his exact job was, he said, "I run the prop credit trading book for the bank in India where I invest in liquid corporate debt paper and securitise illiquid corporate debt with a trading view based on interest rate movements and credit spreads." And to think, I sell newspapers!